Two hundred and fifty skulls have been found in a mass grave in the eastern Mexican state of Veracruz, says state prosecutor Jorge Winckler. Speaking to TV network Televisa, Mr Winckler said that drug traffickers had used Veracruz for many years as a dumping ground for bodies. He said only part of the site had been searched so far and did not rule out that more bodies could be found. According to Mr Winckler, some of the remains could be years old. He told Televisa that "Veracruz is an enormous mass grave". "In my view, once we have opened all the mass graves in the state, [Veracruz] could become the biggest mass grave in Mexico, or even the world," he said. "For many years, organised crime disappeared people with the connivance of the authorities and they went and dumped them in mass graves created for that purpose." He also blamed the previous state government led by the now-fugitive governor Javier Duarte for not doing enough to find and identify the bodies of people reported as disappeared. However, he did not say when and by whom the remains had been discovered. Disappearing Duarte: Where is the Veracruz governor? 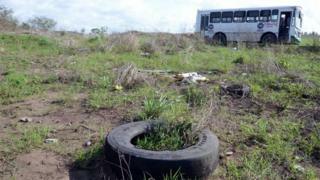 Discoveries of mass graves are not unusual in Mexico. Following the disappearance of 43 students in Guerrero state and the subsequent search for them, scores of mass graves were found in that region. Mr Winckler said that the former Veracuz governor who went on the run after a corruption investigation against him was launched was to blame for reports of disappearances not being investigated earlier. Relatives of disappeared people have long been campaigning for more to be done to help them find their loved ones.